« I made it to San Jose! I usually don’t get to join Yoshi’s family until right around New Year’s Day, so I have never been able to take part in their family’s mochitsuki or mochi pounding (usually a few days before New Years) until this year. Last night, Yoshi’s mom soaked 5 lbs of sweet glutinous rice (mochigome) before we went to bed and then we got up early this morning to pick up Yoshi’s Auntie J (who also soaked another 5 lbs of rice). We headed over to San Leandro where Yoshi’s Aunt & Uncle (D & K) hosted the mochitsuki in their beautiful home and (especially) kitchen. Another Uncle & Aunt were there when we arrived, probably with more soaked rice. To be honest, there was no ACTUAL pounding of mochi as there were two mochi machines running which replaces the need for anyone to have to pound the mochi with a wooden mallet (causing wood splinters) or anyone to risk getting their hands smashed by said mallet while flipping the mochi. 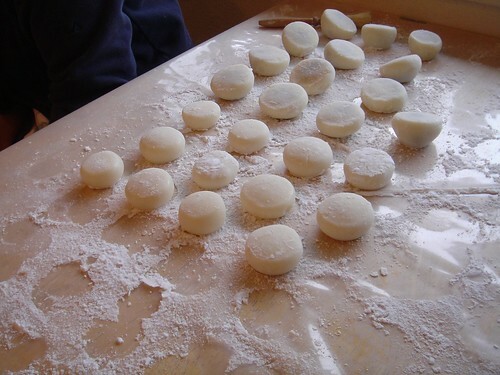 That said, the mochi still needed to be shaped into rice cakes while HOT HOT HOT so we all sat around the counter while Aunt D pinched off pieces of the hot mochi and threw it at us to shape. Some of the ones we made were filled with red beans (yuck! ), but most of the ones we did were plain. Can I just say that fresh mochi is yummy?!?!? Anyway, I can’t remember how many batches we did, but after a full day of mochi making, I was tired and I fell asleep in the car as Yoshi, Yoshi’s Mom, and Auntie J went to Costco to pick up a few things. After that, we had dinner at Mimi’s Cafe, swung by dropped some things off in Campbell at Yoshi’s cousin’s family’s place (we were introduced to the High School Musical game on Wii by the two older nieces), before finally get back to Yoshi’s mom’s place in San Jose. I can’t wait to see you and yoshi tomorrow! Yay! Is mochi making the equivalent of Mexicans getting together to make tamales? They sure do look good, and I’m a fan of red beans! What’s it taste like, anyway? Oishii! I LOVE red bean filled! I usually like to eat them with Ocha. How funny you were making Omochi this year ’cause my human pet animal on facebook is the rabbit on the moon- he makes omochi for New Years for those that don’t know. I haven’t read you in ages and I hope all is well. Have a properous new year in 2008, Joz! I miss you!